هیدروکربن‌های آروماتیک چند حلقه‌ای (PAH)‌ و آلکان‌های نرمال، گروه بزرگی از آلاینده‌های پایدار محیطی را تشکیل می‌دهند. ‌در این مطالعه به‌منظور بررسی پراکنش و منشاء ترکیبات PAH و آلکان‌های نرمال در رسوبات سطحی سواحل جنوب غربی دریای خزر و مقایسه آن‌ها با استاندارهای موجود، تعداد 18 نمونه رسوب سطحی از 2 نیم‌خط عمود بر ساحل استان گیلان (سنگاچین و هشت پر، از اعماق 10، 20 و 50متری) جمع‌آوری شد و نمونه‌ها با استفاده از دستگاه کروماتوگرافی گازی با طیف سنج جرمی مورد آنالیز قرار گرفتند. منشاء آلکان‌های نرمال بر اساس شاخص‌های (95/0-76/0)CPI ، (56/6-3/3) U/R، (42/0-21/0) pr/ph انجام گرفت. 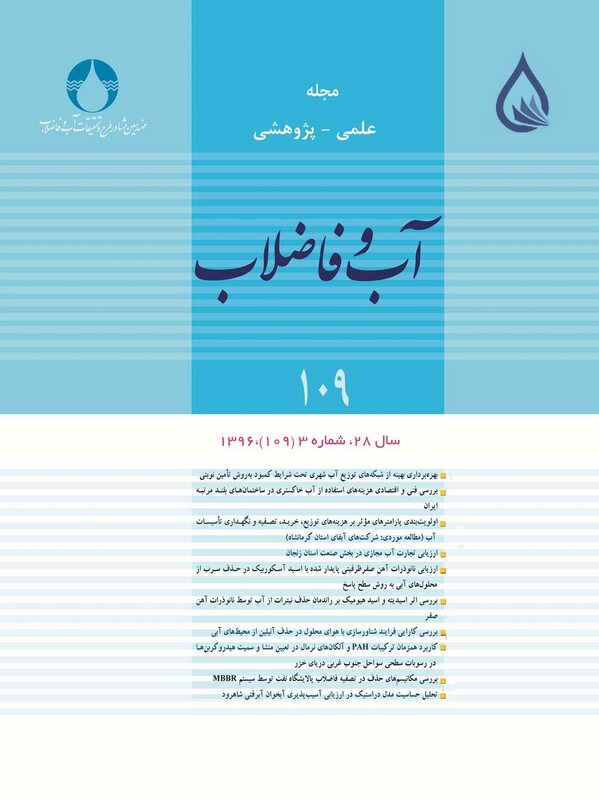 همچنین تعیین منشاء ترکیبات PAH به روش نسبت‌‌های تشخیصی (37/13-93/1) LMW/HMW، (7/16-44/11) Phenanthrene/Anthracene، (33/10-69/4) Chrysene/Benzo(a)anthracene، (69/0-53/0)Fluoranthene/Pyrene و (08/0-05/0) MP/P انجام گرفت که بر اساس این نسبت‌ها وجود منشاء غالب پتروژنیک برای هیدروکربن‌ها در منطقه ثابت شد. غلظت کلی 30 ترکیب PAH و آلکان‌های نرمال در رسوبات به‌ترتیب 95/626 تا 53/3842 نانوگرم بر گرم و 8/823 تا 5/3899 میکروگرم بر گرم به‌دست آمد. بر اساس استانداردهای آمریکا سطوح ترکیبات نفتالین، آسنفتیلن، آسنفتن و فلورن بالاتر از غلظت استاندارد ERLs در ایستگاه‌های عمق 50 متری هشت پر و سنگاچین بود، درحالی که بر اساس استانداردهای کانادا، سطوح این ترکیبات در تمام ایستگاه‌های بالاتر از استاندارد ISQGs بود. نکته حائز اهمیت غلظت بالای ترکیب نفتالین به‌عنوان سمی‌ترین ترکیب PAH در تمام ایستگاه‌ها بود که نیاز به توجه بیشتر به این ترکیب را برای اتخاذ روش‌های صحیح مدیریتی می‌طلبد. Polycyclic aromatic hydrocarbon (PAH) compounds and normal alkanes form a large group of undegradable environmental contaminats. This study aims to determine the sources and distribution of oil pollution (PAH compounds and normal alkanes) in the sediments of the southwestern coastal areas of the Caspian Sea and to compare their levels with the relevant standards. For this purpose, 18 surface sediment samples were collected from depths of 10, 20, and 50 meters along two transects in the vertical direction located in the coastal areas of Sangachin and Hashtpar (Gilan Province). The samples were then examined using mass-spectrometric gas chromatography. The origins of n-alkanes were identified using CPI index (0.76-0.95), U/R (3.30‒6.57), and Pristane/Phytane (0.21‒0.42). The sources of PAHs were determined using the index ratios of LMW/HMW (1.93‒13.37), Phenanthrene/Anthracene (11.44‒ 16.7), Chrysene/Benzo (a) anthracene (4.69‒10/33), Fluoranthene/Pyrene (0.53‒0.69), and MP/P (0.05‒0.08). Results confirmed the dominant petrogenic source of the hydrocarbons found in the region. The total concentrations of 30 aliphatic hydrocarbons and PAHs in the sediments ranged from 823.8 to 3899.5 µg/g and from 626.95 to 3842.5362 ng/g, respectively. Comparison of the measured PAH concentrations with US sediment quality guidelines revealed that the levels of naphthalene, fluorine, Acenaphthylene, and Acenaphthene exceeded the ERLs at stations with depths of 50m in Sangachin and Hashtpar while comparisons with Canadian standards indicated that they were higher than PELs at all the stations sampled. A major point of great concern is the high concentration of naphthalene as the most toxic PAH compound, which naturally warrants due attention to adopt appropriate management programs. Abessi, A. & Saeedi, M., 2010, "The origin of oil hydrocarbons in southern coastal sediments of the Caspian Sea in vicinity of Golestan and Mazandran province", Journal of Environmental Studies, 36(55), 43-58. Baumard, P., Budzinski, H., Michon, Q. & Garrigues, P., 1998, "Origin and bioavailability of PAH in the Mediterranean Sea from mussel and sediment records", Estuarine, Coastal and Shelf Science, 47, 77-90. Bixiong, Y., Zhihuan, Z. & Ting, M., 2007, "Petroleum hydrocarbon in surficial sediment from rivers and canals in Tianjin, China", Chemosphere, 68, 140-149. CCME., 1999, "Canadian sediment quality guidelines for the protection of aquatic life: Polycyclic aromatic hydrocarbons (PAHs)", In: Canadian environmental quality guidelines, Canadian Council of Ministers of the Environment: Winnipeg, pp. 1-16. Chen, L. G., Ran, Y. & Xing, B. S., 2005, "Contents and sources of polycyclic aromatic hydrocarbons and organochlorine pesticides in vegetable soils of Guangzhou, China", Chemosphere, 60, 879-890. Dongen, B.E.V., Rowland, H.A.L., Gault, A.G., Polya, D.A,, Bryant, C.& Pancost, R.D., 2008, "Hopane, sterane and n-alkane distributions in shallow sediments hosting high arsenic groundwaters in Cambodia", Applied Geochemistry. 23, 3047-3058. Gao, X. & Chen, S., 2008, "Petroleum pollution in surface sediments of Daya Bay, South China, revealed by chemical fingerprinting of aliphatic and alicyclic hydrocarbons", Estuarine, Coastal and Shelf Science, 80, 95-102. Gao, X., Chen, S., Xie, X., Long, A. & Ma, F., 2007, "Non-aromatic hydrocarbons in surface sediments near the Pearl River estuary in the South China Sea", Environmental Pollution, 148, 40-47. Harris, K.A., Yunker, M.A., Dangerfield, N. & Ross, P.S., 2011, "Sediment-associated aliphatic and aromatic hydrocarbons in coastal British Columbia, Canada: Concentrations, composition, and associated risks to protected sea otters", Environmental Pollution, 159, 2665-2674. Jeng, W., 2007, "Aliphatic hydrocarbon concentrations in short sediment cores from the southern Okinawa Trough: Implications for lipid deposition in a complex environment", Continental Shelf Research, 27, 2066-2078. Johnson, L.L., Collier, T.K. & Stein, J.E., 2002, "An analysis in support of sediment quality thresholds for polycyclic aromatic hydrocarbons (PAHs) to protect estuarine fish", Aquatic Conservation, 12(5), 517-538. Long, E.R., Macdonald, D.D., Smith, S.L. & Calder, F.D., 1995, "Incidence of adverse biological affects with ranges of chemical concentrations in marine and estuarine sediments", Environmental Management, 19 (1), 81-97. Maioli, O. L. G., Rodrigues, K. C., Knoppers B. A. & Azevedo, D. A., 2011, "Distribution and sources of aliphatic and polycyclic aromatic hydrocarbons in suspended particulate matter in water from two Brazilian estuarine systems", Continental Shelf Research, 31, 1116-1127. Medeiros, P.M., Bı´cego, M.C., Renato Menezes Castelao, R.M., Rosso, C.D., Fillmann, G. & Zamboni, A. J., 2005, "Natural and anthropogenic hydrocarbon inputs to sediments of Patos Lagoon Estuary, Brazil", Environment International, 31, 77-87. Nemirovskaya, I.A. & Brekhovskikh, V.F., 2008, "Origin of hydrocarbons in the particulate matter and bottom sediments of the northern shelf of the Caspian Sea", Oceanology, 48, (1), 43-53. Nishigima, F.N., Weber, R.R. & Bicego, M.C., 2001, "Aliphatic and aromatic hydrocarbon in sediments of Santos and Cananeia SP, Brazil", Marine Pollution Bulletin, 42(11), 1064-1072. Oliveira, C. & Madureira, L., 2011, "Assessment and sources of nonaromatic hydrocarbons in surface sediments of three harborsin Santa Catarina State, Brazil", Environmental Monitoring and Assessment, 173, 91-105. Perra, G., Renzi, M., Guerranti, C. & Focardi, S.E., 2009, "Polycyclic aromatic hydrocarbons pollution in sediments: distribution and sources in a lagoon system (Orbetello, Central Italy)", Transitional Waters Bulletin, 3(1), 45-58. Riyahi Bakhtiari, A., Zakaria, M. P., Ismail, M., Nordin, H., Lajis, M. & Bi, X., 2011, "Variation and origins of aliphatic hydrocarbons in sediment cores from Chini lake in Peninsular Malaysia", Environmental Forensics, 12(1), 1-12. Riyahi Bakhtiari, A., Zakaria, M.P., Ismail Yaziz, M., Nordin, H, Lajis, M. & Bi, X., 2010, "Polycyclic aromatic hydrocarbons and n-alkanes in suspended particulate matter and sediments from the langat river, Peninsular Malaysia", Environment Asia, 2, 1-10. Saha, M., Togo A., Mizukawa, K., Murakami, M., Takada, H., Zakaria, M.P., et al., 2009, "Sources of sedimentary PAHs in tropical Asian waters: Differentiation between pyrogenic and petrogenic sources by alkyl homolog abundance", Marine Pollution Bulletin, 58, 189-200. Sicre, M.A., Marty, J.C., Saliot A., Aparicio, X., Grimalt, J. & Albaiges, J., 1987, "Aliphatic and aromatic hydrocarbons in different sized aerosols over the Mediterranean Sea", Occurrence and Origin Atmospheric Environment, 21, 2247-2259. Silva, T.S., Lopes, S.R.P., Spörl, G., Knoppers, B.A. & Azevedo, D., 2012, "Evaluation of anthropogenic inputs of hydrocarbons in sediment cores from a tropical", Microchemical Journal, 109, 178-188. Tolosa, I., Mora, S. & Sheikholeslami, M.R., 2004, "Aliphatic and aromatic hydrocarbons in coastal Caspian Sea sediments", Marine Pollution Bulletin, 48, 44-60. Walker, S. E., Dickhut, R. M., Chisholm-Brause, C., Sylva, S. & Reddy C. M., 2005, "Molecular and isotopic identification of PAH sources in a highly industrialized urban estuary", Organic Geochemistry, 36, 619-632. Yunker, M.B. & Macdonald, R.W., 2003, "Petroleum biomarker sources in suspended particulate matter and sediments from the Fraser River Basin and Strait of Georgia, Canada", Organic Geochemistry, 34, 1525-1541. Zakaria, M.P. & Mahat, A.A., 2006, "Distribution of polycyclic aromatic hydrocarbons (PAHs) in sediments in the Langat Estuary", Coastal Marine Science, 30(1), 387-395. Zakaria, M.P., Horinouchi, A., Tsutsumi, S., Takada, H. & Ismail, A., 2000, "Oil pollution in the Straits of Malacca, Malaysia: Application of molecular markers for source identification", Environmental Science and Technology, 34, 1189-1196.